Robert Coombs spent his days on the river Thames from an early age. His first public race took place on 4 July 1836. On 19 August 1846 he managed to beat Charles Campbell and became Champion of th Thames. He defended his title several times until he was beaten by Tom Cole on 24 May 1852. Cooms had four sons and two of them became oarsmen as well but they never equalled the successes of their father. Towards the end of his life he was poor and he lost his mental powers. Nine months before his death he was installed at an asylum in Maidstone and there he died on 25 February 1860. He was buried at Brompton cemetery in London. 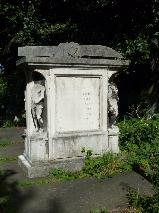 The grave of Robert Coombs at Brompton Cemetery, London.